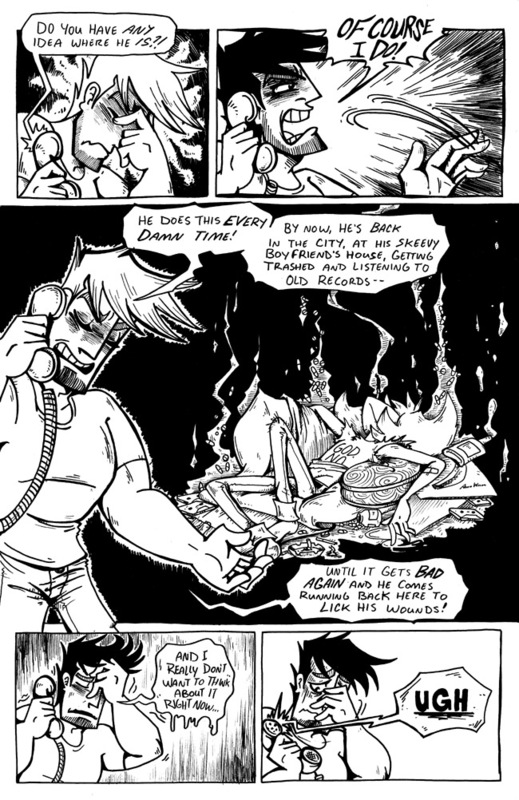 Eddie is just upset that Fritz isn’t getting trashed and listening to old records at his house. Sorry about the spotty updates this last month (or year…) but my excuse this time is that I had the killer flu last week, and I also had to go back home this week. ALWAYS throws me off! I have other projects I want to work on, but first I will try to get this on track. Also, please ignore that hand in the second panel, thanks. Oh man. That has to be hard for Eddie….I know what it’s like for the licking wound stage. All I can think about is Eddie worrying if fritz is dead or not….fritz you coked up little troll…as much as I love your character you have to give Eddie a break….you’re giving him gray hairs and he’s not even old yet. I have no idea why it did that, but I don’t understand compoopers too well. The suspense and anguish along with the comedy is what makes this webcomic so original and engenius! It keeps me in a twisted suspense dying with anticipation for what cliff hanger page will come our way next.